ARE YOU READY TO ROCK, HOUSTON & AUSTIN...WITH SCHOOL OF ROCK? We love that BBVA Compass Broadway at the Hobby Center presents School of Rock – The Musical that will play The Hobby Center in Houston through February 4, 2018. 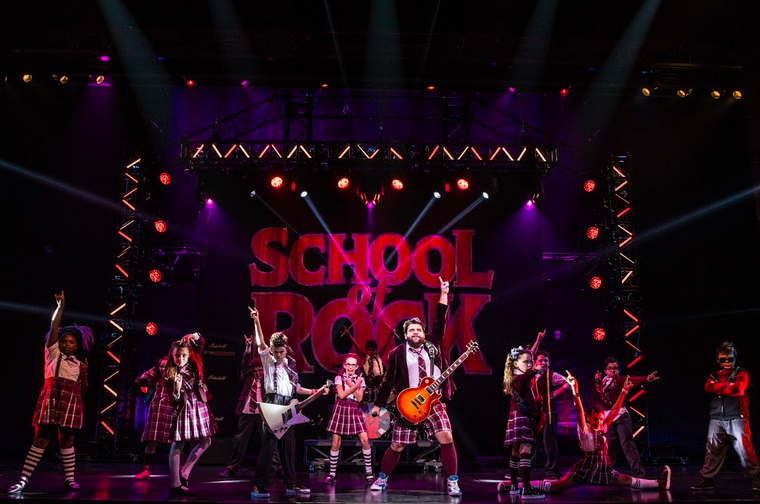 In Austin, Lexus Broadway in Austin presented by Texas Performing Arts tickets for School of Rock – The Musical will play Bass Concert Hall February 13 - 18, 2018. Rocking the roofs off theaters across America, the School of Rock – The Musical national tour stars Rob Colletti as Dewey, Lexie Dorsett Sharp as Rosalie, Matt Bittner as Ned, Emily Borromeo as Patty, Merritt David Janes as Dewey Alternate, Deidre Lang as Ms. Sheinkopf, Olivia Bucknor as Shonelle, Theodora Silverman as Katie, Chloe Anne Garcia as Marcy, Carson Hodges as Mason, Gianna Harris as Tomika, Gilberto Moretti-Hamilton as Freddy, Phoenix Schuman as Zack, John Michael Pitera as Billy, Theo Mitchell-Penner as Lawrence and Ava Briglia as Summer. The adult ensemble features John Campione, Patrick Clanton, Christopher DeAngelis, Kristian Espiritu, Melanie Evans, Liam Fennecken, Kara Haller, Elysia Jordan, Jameson Moss, Sinclair Mitchell, Tim Shea and Hernando Umana. The kid’s ensemble features Rayna Farr, Bella Fraker, Alex Louis, Tommy Ragen, Gabriella Uhl and Aiden Niklas Villa. TICKETS: Start at $35 and are available by phone at 800.982.2787; online at www.TheHobbyCenter.org or www.BroadwayAtTheHobbyCenter.com; The Hobby Center Box Office (800 Bagby, Houston, TX 77002) and all Ticketmaster outlets. TICKETS: Start at $30.Tickets are available at http://www.BroadwayinAustin.com, http//:www.texasperformingarts.org, the Bass Concert Hall ticket office, all Texas Box Office Outlets, by phone at 512.477.6060.